This one’s quick and easy, and there’s a good chance you already know this if you’re a seasoned post professional. But I see poorly sharpened footage all the time, so it must not be totes common knowledge. Don’t use Sharpen. That’s like a race car driver using an automatic transmission. Right off the bat, set it to 100% Amount, and 0.3 Radius. If that doesn’t do the trick, then try upping Amount to 200% at the most, or Radius to 0.5 maximum. But generally, going beyond that will cause negative byproducts. 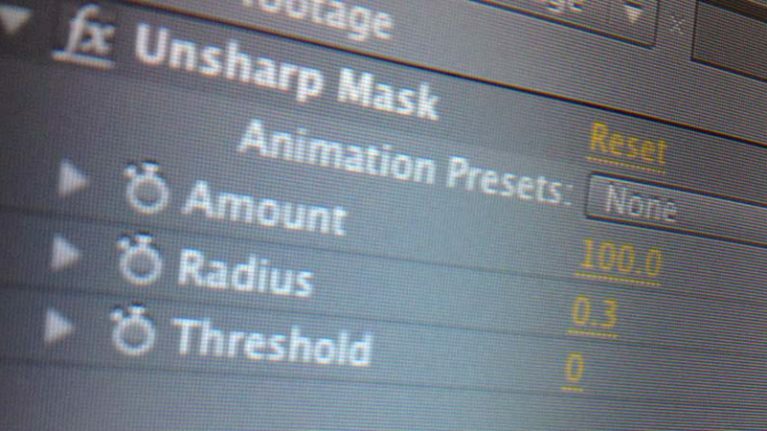 Lastly, adjust Threshold as needed… for video there are many factors involved in deciding whether to set it high or low (types of skin, lighting, how much geometric stuff is in a shot, how noisy your footage is, etc), so really just slide it around and eyeball it to taste. 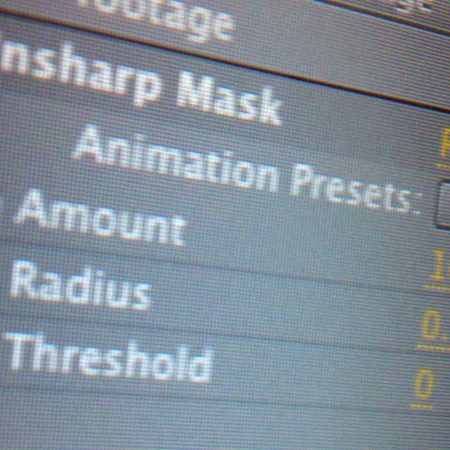 So there ya go… Unsharp Mask, 100% / 0.3, or adjust to taste within ranges 50-200% / 0.3-0.5. And generally, this applies to still photos as well. The settings should be pretty universal whether you’re doing it in Premiere Pro, Final Cut Pro, After Effects, Sony Vegas, or whatever else. Nope, boring. 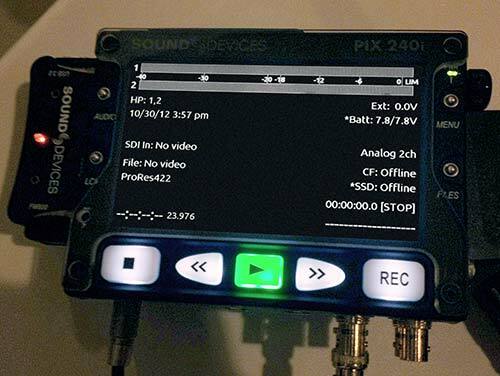 Just filename suggestions for recording footage to an external recorder like a Sound Devices PIX 240i. Recently I was DP on a feature, shot on a Sony F3 with one. 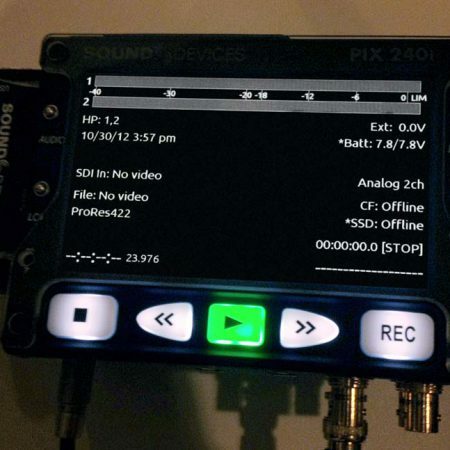 I assume other external recorders allow for flexible filenaming with automated take number advancement, just like the PIX 240i does — which is great. Because of this, I recommended to the producers that we shoot without slating. It can save significant time on a production, especially one like ours where we had a language barrier, chaotic locations, and a tight schedule… along with all the other factors of a low budget production. Though there’s one caveat… I don’t have a 240i in front of me, so I’m not 100% certain you can get all that stuff into the filename. But as I recall, you can manipulate the naming pretty heavily. Including the date may seem cumbersome and maybe even unnecessary at first, but to me it is now essential. We didn’t use it when shooting the aforementioned feature, and that’s exactly how I learned that we should have. You may end up shooting shots from a particular scene many days apart from one another, so trying to figure out what the last numbered take was for that scene can be time consuming, if even possible at all when on location. But you probably can remember if it was earlier that day. So anyways, this can help prevent you from having shots with the same filename, which can be disastrous if one file happens to overwrite the other when placed into the same folder. Note the three digit numeral for the scene & take numbers. That’s so if you put all your .mov files into the same folder, they’ll stack in proper order, making it easy for you to find stuffz. Also, don’t use spaces instead of underscores… yes, I know it’s not 1997 anymore, but if for some reason the spaces cause some kind of problem for like your sound designer or colorist, then you’ll get to send a text message to yourself with nothing but a saddyface emoticon in it. Also, I’ll get to laugh loudly in your face. And I’ll probably make sure I eat something stinky immediately before. Like dog feces. That’ll teach you a lesson. Haha, in your face, bro. Jaykay, that’s just simulated schadenfreude– I would probably send you an upbeat, encouraging emoji to make you feel better, like that iPhone one of the twins in cat suits dancing. The extra underscore before the take number is just there to visually scan better. Also, you can use s000 (scene #0) for random unassigned stuff like 2nd unit exteriors, etc. I prefer this over other methods since those shots will all be easy to find in one place. If you have a script supervisor on set, they can notate the “o’clock” time for shot numbers if you’re not slating (ie. shot3A was shot 2:16 – 2:38pm), and the assistant editor can then check the “date created” and rename the clips in the editing software, or just organize them into folders if you don’t need to go that hard. Yeah, so anyways, based on my experiences on productions big and small, this format should work as a catch-all, with minimal time, energy, or headache during shooting and post. You can add more stuff to the filenames I guess, but going into the recorder’s interface to add shot numbers can be a slow and confusing hassle, especially if you’re not a fully crewed production with a dedicated script supervisor and 2nd AC. I would recommend the sorting of footage by shot be done in editing software, where it’s pretty simple & painless. There are Super 16 lenses that have been sitting around collecting dust for the last 5-10 years, and you can usually scoop some up at bargain prices. That’s because, aside from a minority of Red users, no one’s been using them, due to HD sucking all the wind from its sails like some sort of gigantic cloud vampire. No, I’m not drunk. Yeah so anyways, that all might change now that the Blackmagic Cinema Camera is starting to ship in quantity. But here’s one thing to keep in mind: some still photography zoom lenses maintain their small image circle due to their particular design, so the same may apply to some s16 zooms as well. The results don’t look too great for full BMCC sensor coverage. 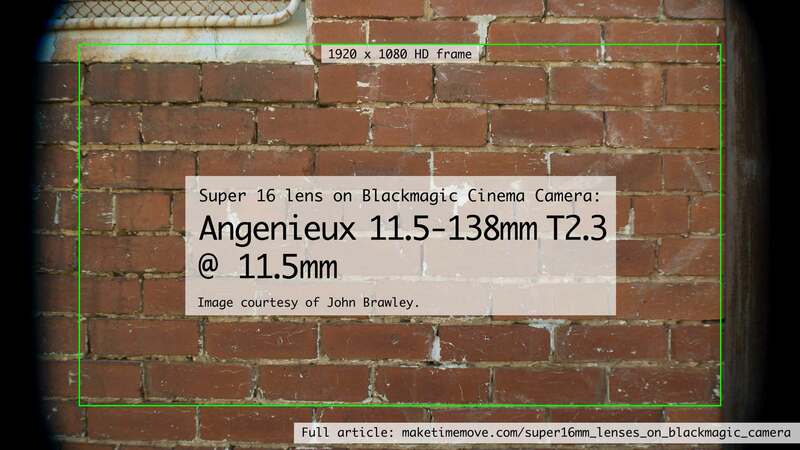 The Angenieux maintains a small image circle, and the Canons show noticeable chromatic aberration outside the s16 picture area, even when they cover the sensor. 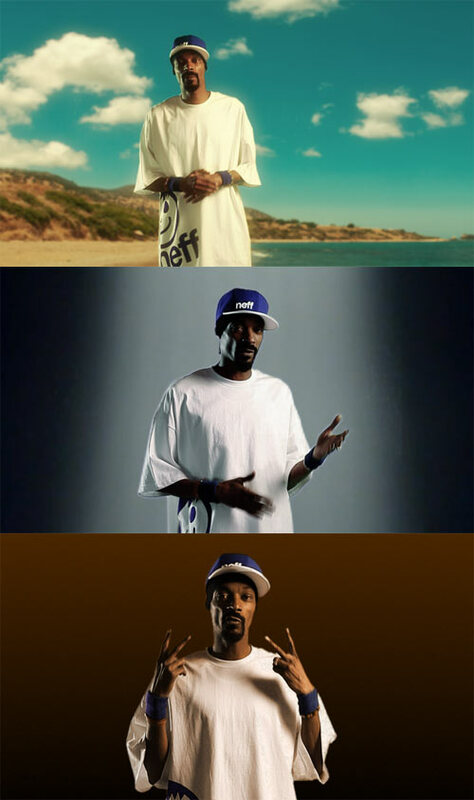 You can see all the DNGs via his dropbox link in this Blackmagic Forum thread. 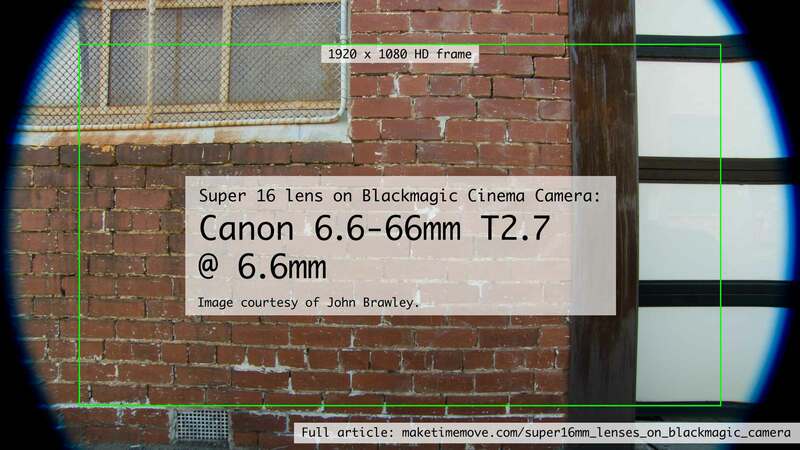 A few paragraphs down, I’ve added examples of how these lenses can work for the BMCC via a 1080 center extract. 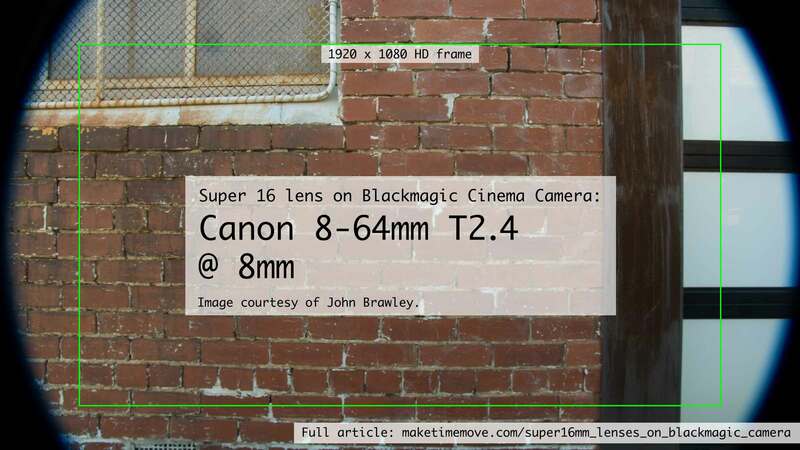 I have no idea if they’ll fill the BMCC sensor. Do long focal length primes have larger image circles than their short focal length counterparts? Maybe. Image circle sizes vary from manufacturer to manufacturer, and product line to product line. So the only way to know is to test that specific lens. You can click here or on the picture to see a full res version of this BMCC 2432 x 1366 frame diagram. Notice how the Super 16mm picture area is just big enough to cover the extracted 1920 x 1080 HD frame from the full BMCC frame? Boom, there ya go. So it’s all good with using s16 lenses. You can click on them to see ’em as full res 10% quality jpegs… which means they’re just for examining the image circle, and not the image quality of the camera. You can get to the original DNGs via this Blackmagic Forum thread. Mucho thanks to John Brawley for letting me use these frames. You’ll have to shoot in 2.5K RAW mode. 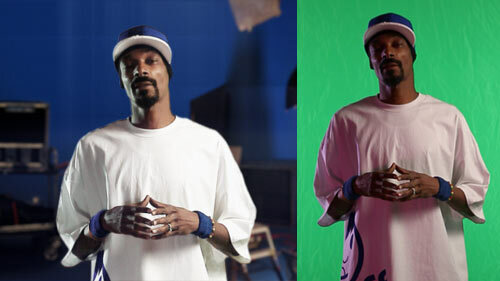 Obviously the downsampled 1920 x 1080 ProRes or DNxHD modes won’t work for this. You’ll need to mark the 1920 x 1080 center on your viewfinder. This is actually not that big of a deal. You just get some clear touch screen protective cover, and then make your markings via trial and error… ie. set up a tripod & chart/whatever, import footage & perform the extract, then mark the cover. 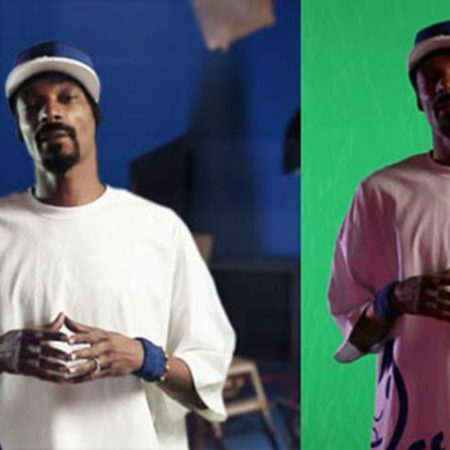 I do this exact process for certain kinds of VFX shots all the time, it’s easy. You’ll have to do the 1080 center extract in post, but it’s hecka easy. Do I even really need to explain this? I will, just in case. In whatever software, make your timeline/composition/whatever 1920 x 1080. 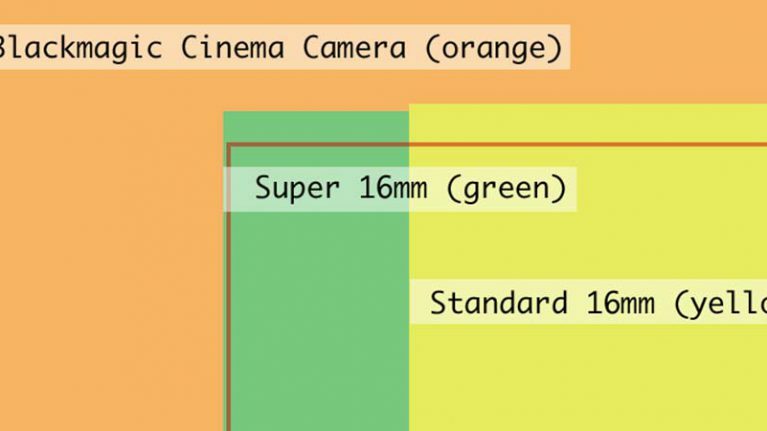 Set your BMCC footage to be at 100% scale/size, that way it’s only showing the center. If a particular shot doesn’t need the 1080 extract, then change its scale/size to 79%. It’s obviously not going to look as good as the full sensor 2400 x 1350 image that’s been scaled down to 1920 x 1080, because of Bayer filtering mumbo jumbo that you can google. Whether or not the optical resolution is good enough is up to you… but if your basis of comparison is a DSLR/DSLM, then it likely will. From the samples I’ve seen, a 1080 center extraction looks pretty great. And if you do see de-Bayer artifacts, try extracting from a slightly larger area than 1920 x 1080 if your lens’ image circle allows for it. 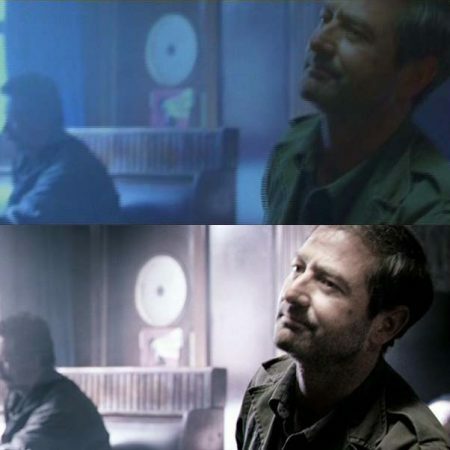 If you’re thinking it’s just weird and strange to capture image areas that are going to be discarded or unseen by the viewing audience, just keep in mind that it’s standard procedure with most non-anamorphic lensed 35mm shooting formats. 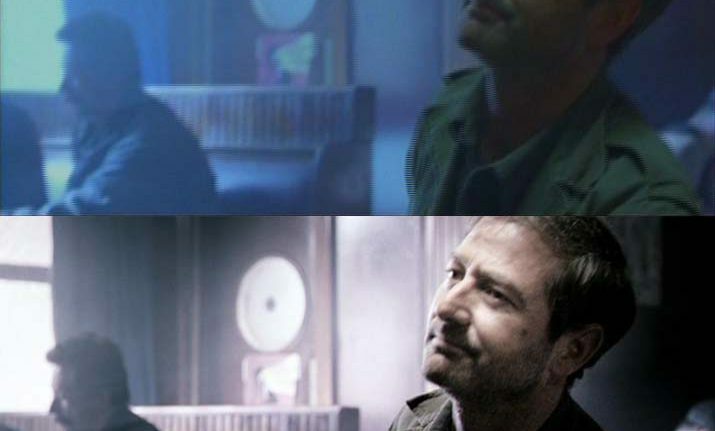 Also, cropping in to 1080 on the BMCC is very similar, in principle, to the crop resolution modes of the Red cameras. Plus, really, your work is 99% likely to ultimately be seen in 1080 HD anyway. Is the 1080 center extraction worth all the extra work? Probably only if you just really wanna shoot on a fast cine zoom that’s affordable. 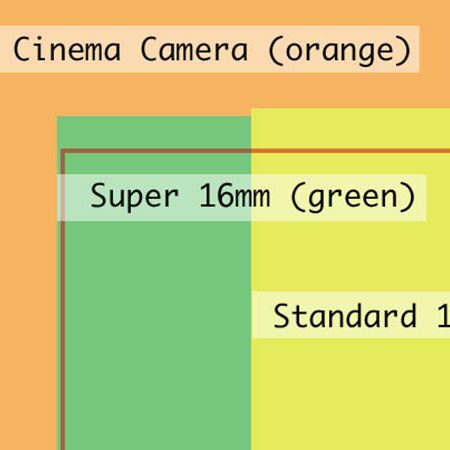 Also, if you’re content with shooting for a 720 HD finish, you can use standard 16mm format lenses… by cropping to 1578 x 888 and then downscaling to 1280 x 720. 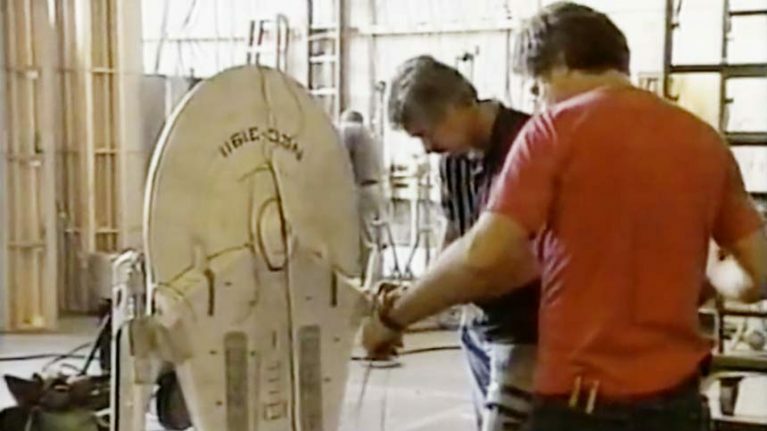 Movie Magic was a really great nonfiction/documentary cable show in the 90s that gave actually useful insight into film special & visual effects, even though it was made for a general audience. 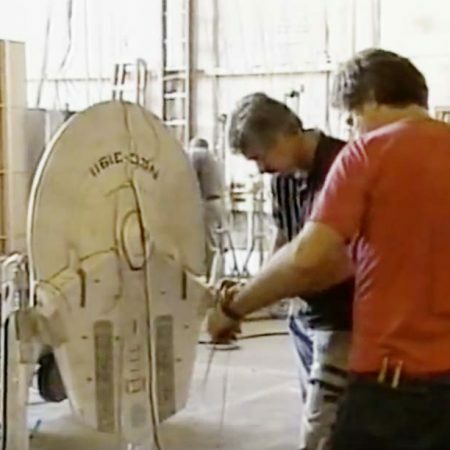 I remember being a teenager and seeing the segment showing the multiple lighting passes of the photography of the Star Trek ship model and feeling the sensation of revelation as something clicked in my brain. Yeah so anyways, some of the episodes are on the ol’ youtubes, so check them out.